It is a truth universally acknowledged that a single person in possession of a desire for 12 tacos must be in want of a cover story. Not this person, just a person. Hypothetically speaking. 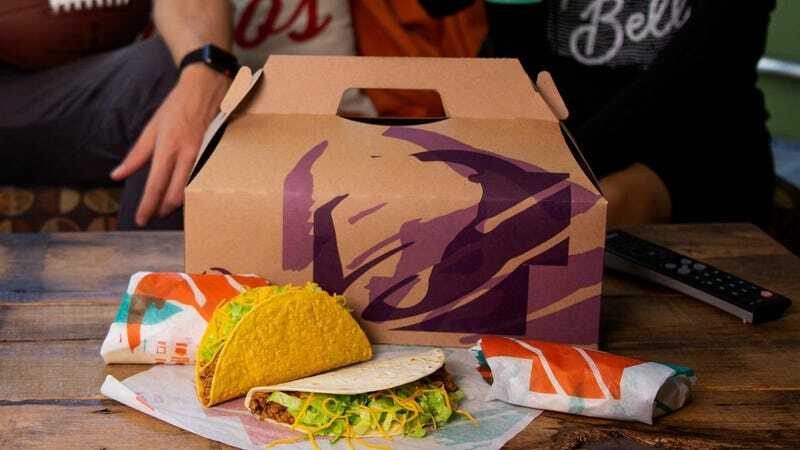 In theory, the announcement of Taco Bell’s new Party Packs—handy to-go boxes filled with one of three taco or taco/burrito collections—should be wondrous news for drunk college students, attendees of bachelorette parties, and those planning to get high with Brian and watch Planet Earth all day. It is good news for those people, or anyone else in a group who wants 10 or 12 tacos in a real damn hurry. But let’s be honest—the secret target audience for these Party Packs are people, not saying who, just people who sometimes want loads of soft-shell tacos and would like to order them without getting a weird look from the person in the drive-through window, okay? The packs, which can be customized to accommodate vegetarians, fervent soft taco-lovers, and so on, come in three varieties. The Taco Party Pack features a mix of 12 crunchy or soft tacos (you pick the ratio). The Taco Variety Pack includes six crunchy or soft tacos and six Nacho Cheese Doritos Locos Tacos. The Grande Meals pack includes a mere 10 items, but those 10 are a selection of bean burritos, soft tacos, and crunchy tacos (again, you pick the number of each). So sure, you’re picking what goes in each Party Pack for you and your “friends,” but at least you’re technically only ordering one item. A Takeout colleague would like to assure you all that ordering two drinks with your giant meal isn’t fooling anyone, so those wishing to save face during their Taco Bell shame runs will perhaps want to go the Party Pack route. They’ll be able to do so beginning October 18, both in restaurants and via GrubHub. The packs are also 15 percent off through the Taco Bell app through the end of the month. If, you know, you like that sort of thing. I don’t.